For more than 50 years, Windings has provided engineered electromagnetic solutions for critical applications in Aerospace, Defense, Automotive, Medical, Oil & Gas and general Factory Automation. As a full-service provider, Windings is a leader in the design, test, manufacture and support of custom electric motors, generators and related components including rotors, stators, lamination stacks and insulation systems. Windings business structure was converted to an Employee Stock Ownership Plan (ESOP) in 1998 and we have been 100% employee owned since 2008. 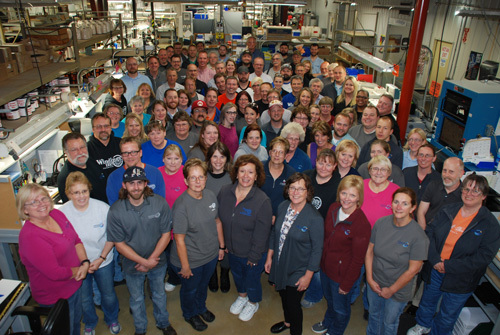 Being 100% employee owned means that every one of our 100+ employees, and only our employees, is either an owner or is on the path to becoming an owner. Because our employees have a vested interest, we have the luxury of being able to take a long-range view and focus on our customers and our employees when we make our decisions. We believe that employee ownership makes us more engaged, motivated, productive, innovative and happy; and we believe that our customers benefit as a result. We care about customer satisfaction, safety, productivity, company culture, our community and more; because caring benefits everyone involved. We are committed to the long-term success of our customers, our employees, our company and our community; when our customers succeed, so does our company, and our employee-owners are rewarded with an increase in the value of their retirement accounts. With more than 165 years of combined experience, the Engineering team partners closely with clients from a project’s inception to ensure an optimized outcome that meets or exceeds our client’s expectations. Windings offers design analysis and simulation, including electromagnetic, thermal and mechanical modeling, with the goal of providing the optimal solution design based on the unique requirements of the application. The decades of manufacturing experience that Windings has can be leveraged to offer Design for Manufacturing and Assembly (DFMA) assistance to lower production costs, improve quality and increase throughput by optimizing the design solution for manufacturing with minimal impact on performance. Windings’ Quality Management System (QMS) Certifications include ISO9001:2015 / AS9100-D, ITAR Registration, RoHS 2002/95/EC and NADCAP Accreditation. US domestic production facilities and capabilities are located in New Ulm, MN for prototyping, pilot production and Low Rate Initial Production (LRIP). As production quantities increase Windings offers seamless transition to their certified production facility located in Mexico. The highest standards in concept development, engineering, material management and part production are maintained while achieving a global presence in the industry.